Alarm indicator, operator and display panels build a bridge between personnel and installed technology. For example, they provide important visual and acoustic information in hospitals and medical locations. With all the technology the focus of the medical staff must be on caring for the patient. This requires an interface that is as intuitive and as simple to use as possible, as well as an easily accessible installation. In addition, DIN VDE 0100 710 2012-10 requires that an acoustic and visual alarm system be provided in a suitable location for each IT system. This must be able to be monitored by the medical staff. Bender meets these requirements with the new COMTRAXX® CP9xx series. It provides an ideal overview of all connected systems at all times, alerts in the event of a fault and ensures convenient system control. Because the system is always in view, you can react to problems at an early stage. The CP9xx is available in 7", 15.6" and 24" as a touch screen with a glass front and thus meets hospital hygiene requirements. Operation is intuitive via the touch screen. The buzzer, which is essential for alarm messages, can be set to three volume levels and acknowledged from any panel. The visualisation is created using an integrated editor. Predefined widgets can visualise information, display switching states and trigger actions. It is just as possible to control surgical lights as to monitor battery-based safety power supply (BSV) systems. Integrated inputs and outputs (IOs) are expandable. 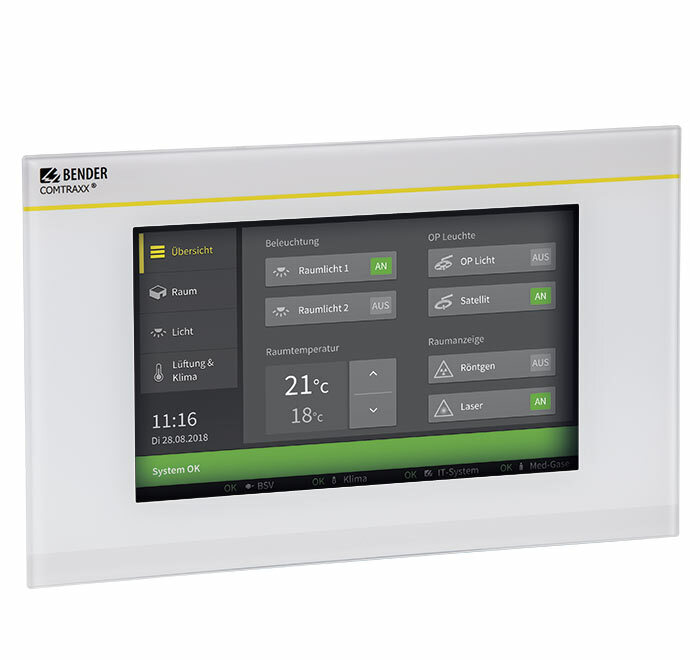 In addition, common interfaces such as KNX, Dali, Modbus etc. are supported. The device offers the possibility to display alarms and messages in 24 languages. If the equipment has to be replaced due to conversion or expansion, there is no need to close the operating theatre for a long time. The CP9xx can be prepared outside the operating theatre. Existing systems with conventional TM panels can be retrofitted very easily in the course of retrofitting measures.